Les: After the highs of “The Archbishop” I was expecting the rest of the season to continue in that good-to-great vein, but I found all three of these episodes to be pretty inconsistent across the board and nowhere near as funny as “The Archbishop” was. There were a lot of things I really liked in them—King Richard’s contagious joy at never-ending war and off-hand references to the other kings he’s killed, the spectacular over-the-top quality of Frank Finlay as Witchsmeller Pursuivant and the wordplay he used to trap Edmund into “confessing,” and the moments of raw enthusiasm when the Black Seal shared their various depravities. However, I don’t think either of the three hung together well as cohesive episodes, with some rocky moments in each and endings I found unsatisfying or nonsensical. And I felt the ending of the series itself was a bit of a letdown. I was expecting something that would wipe the entire cast out given that I know there’s a new incarnation of Edmund every series, but the way they ended this first time felt incredibly abrupt. I blame this chiefly on the finale’s decision to push the whole main cast to the side for most of the episode in favor of the Black Seal, a motley crew that had their moments but ultimately weren’t as well fleshed out as any of the people we spent the last five episodes with. (Particularly the introduction of Hawk, set up as Edmund’s lifelong nemesis we’ve never seen once.) 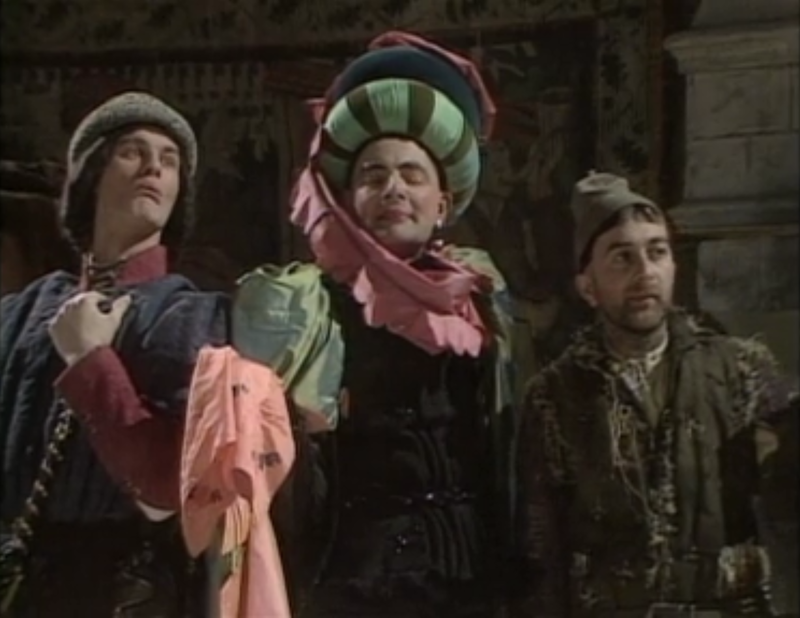 Losing the chemistry of Edmund, Baldrick and Percy was a definite dud in that regard, so much so that it’s unsurprising the latter are the architects of bringing the whole monarchy down—at least when they were helping Edmund out, their idiocy was somewhat controlled. All in all, a flawed series but one that still had some very good moments in it. I look forward to seeing how they’ve learned from it in Blackadder II. Andy: By and large I thought the improvements evident in “The Archbishop” continued through this back half of the season. 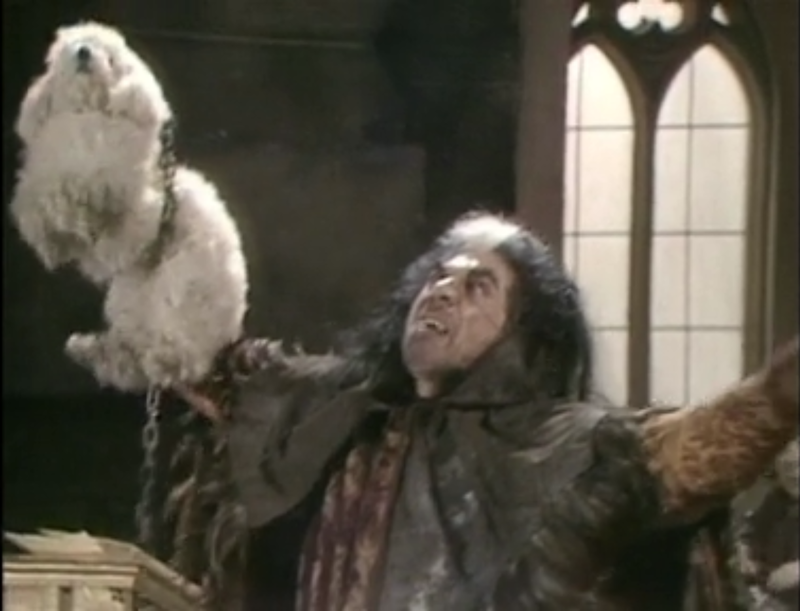 The writing was more self-assured—it takes a kind of nerve, particularly as a British comedy, to spoof the Black Plague and witch hunts, given the comparisons you’ll inevitably invite—and these episodes contained a lot more laugh lines than the first three. The runner in “The Queen of Spain’s Beard” around Richard’s jollily bloodthirsty diplomacy was a favorite. Edmund’s gradually getting sharper, too, leaving his lackeys to play the lackwits. The derision Atkinson, systematically berating Percy, injects into the line “Something you have never seen is slightly less blue than something else you have never seen” represents a huge improvement in the character and the performance. It’s an encouraging sign of what’s to come. Noel: “The Queen of Spain’s Beard” may be the first series’s highlight. Jokes are set up well in advance (Princess Leia of Hungary! ), BRIAN BLESSED is at his bombastic best, and there’s various jokes at the expense of the Spanish, perhaps the only nationality less well-regarded in English comedy than the French (though not by much as “The Black Seal” makes perfectly clear). From the well-thumbed translation jokes (expertly executed by Jim Broadbent as the translator) to the scheming among the trio to get out of the marriage, it’s just a delight. I’m generally fine with “Witchsmeller” though I found the trial bordering on a too-long-of-a-joke approach (even if the jokes were pretty funny; poor carrots). But “The Black Seal” is something of a blah episode. 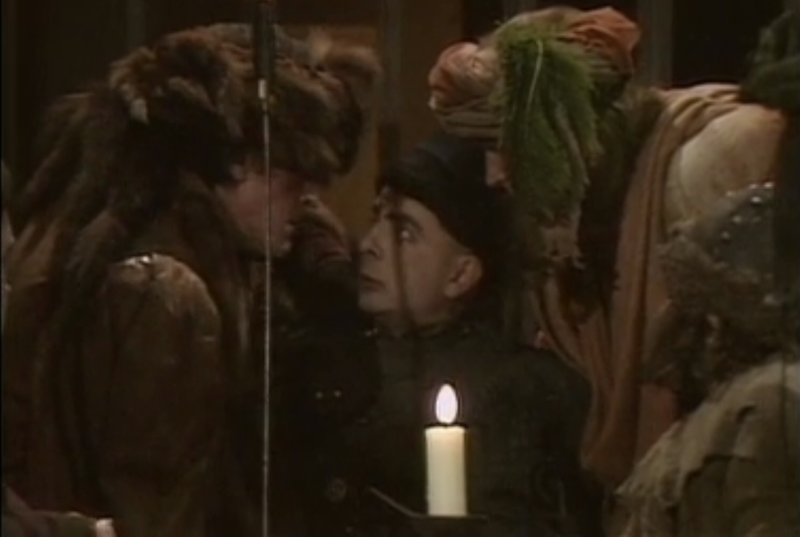 I’m with Les: having Edmund step away from Percy and Baldrick is a really lousy thing to do for a finale (even if they do manage to save the day!). While I’m generally positive on the court intrigue elements, I do feel like it’s bending over backwards to land the Hamlet stuff at the end, even if I love everyone’s death rattles. But Andy is correct, too. Even if I’m not crazy about two of these three, the show is decidedly on better footing here than it is in the initial three. I’m very excited to see what you all think of Blackadder II, which I think we may all enjoy a bit more given its Elizabethan trappings. Cory: Guys! Good news: I didn’t feel as sleepy watching these three episodes as I did during the first three. I agree with Andy and Noel on “The Queen of Spain’s Beard” being the strongest effort of this short season, and of the group, I might be the highest on “The Black Seal” of the four of us. I wouldn’t say that I completely enjoyed myself during this 90-minute chunk, but either there are big improvements with the last three, or I’m simply getting used to this show’s humor and style. Actually, it’s probably a bit of both. The writing and tone of these three episodes is a bit more…controlled. These aren’t calm affairs by any means, and there is sure a lot of zany, cheeky humor that simply doesn’t register with me. However, the characters are more established and it’s therefore easier for me to pick up on humorous little beats or notes that I might have missed in episodes one through three because I didn’t know much of what was going on. In particular, BRIAN BLESSED’s King Richard IV became a real delight to watch. Andy mentioned that Edmund appeared to be getting sharper in these episodes, but that wasn’t really my interpretation of what I saw here. While I would say that he displayed a slightly higher level of competency at times, there were still countless instances where he was made to be the biggest fool in the room. Ultimately, I think the transition he made as a bubbling fool in the pilot to evil schemer in the second episode to something in between for the last four episodes didn’t really work. Clearly, this isn’t a show about the triumph of one man’s intelligence or spirit amid a world of silliness, and I can respect that. Edmund’s skill level seemed to vary depending on what the show or a single scene needed of him. I’ll be the first to admit that A.) This show traffics in jokes and styles that aren’t appealing to me and B.) My knowledge of British history is very pathetic. My hope is that as the show grows and matures and moves into historical periods I’m more familiar with, I’ll be able to appreciate it a great deal more. This first series, though, wasn’t that good. I’m ready to move on.